Will investors shrug off gloomy news about the world economy to push stocks to new record highs? 1. Records tumble: The S&P 500 closed up 0.17% at another record level Friday, boosted by news that U.S. employers added 321,000 jobs in November, making 2014 the strongest year for job growth since 1999. Markets will be watching Monday to see if the Dow Jones Industrial Average can hit a new record at 18,000 points. The index came within 10 points of the milestone during Friday's session. Early signs are that investors may have to wait a while longer, given a few reminders Monday about shaky global growth. 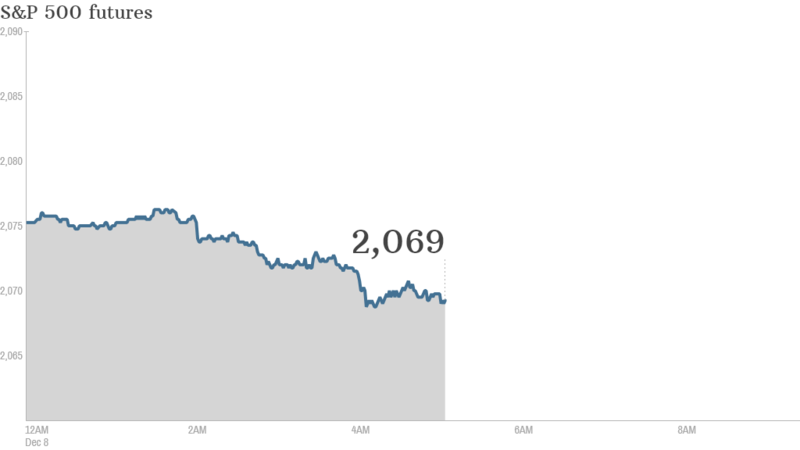 U.S. stock futures were mixed -- S&P futures were down 0.4%, while Dow futures were flat. 2. Japan's recession: The world's third largest economy is in a deeper hole than expected. A second reading of third quarter GDP showed the economy shrank at a faster rate than previously thought, down 1.9% on an annual basis. An initial estimate put the contraction at 1.6%. Voters go to the polls Sunday in parliamentary elections called early by Prime Minister Shinzo Abe in the hope that he'll secure a stronger mandate for his economic revival plan. Japan's Nikkei was flat in a mixed session for Asian markets. 3. Europe weakens: The downward revision to Japan's GDP data, combined with weak trade figures from China and a disappointing reading of German industrial production in October weighed on European markets in morning trade.